The primary purpose of SWAAC is to create a safe space to engage and reflect on leadership issues and opportunities facing individuals who identify as women. 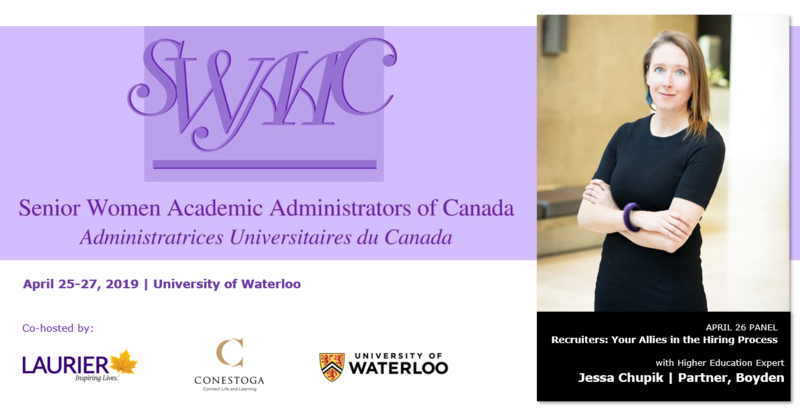 Aspiring female academics and women in senior leadership positions come together to develop and enhance their leadership capabilities, offer mentorship to future leaders, and more importantly, find time to connect with each other. SWAAC 2019 is co-hosted by Conestoga College, Wilfrid Laurier University, and the University of Waterloo on April 25, 26 and 27. The conference will feature distinguished speakers, including Elizabeth Nyamayaro (HeForShe), Shari Graydon (Informed Opinions), and a President's Panel featuring female higher education leaders from across the country. Boyden Social Impact Partner and Higher Education Expert, Jessa Chupik, joins an esteemed group of SWAAC speakers to lend her insights in April 26th panel, Recruiters: Your Allies in the Hiring Process.